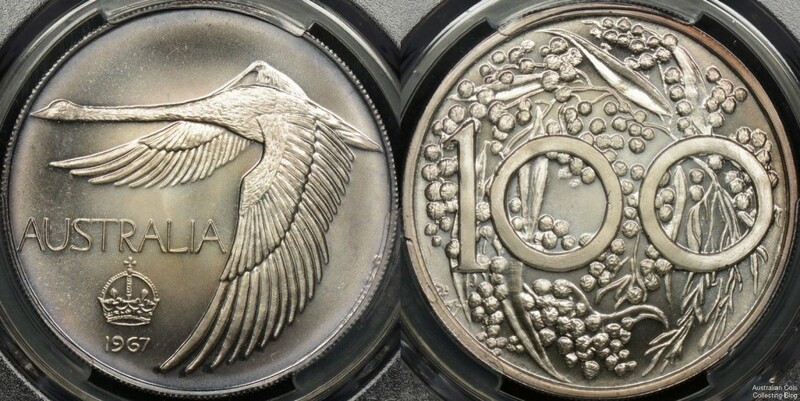 The 1967 “Goose” dollar is not an official issue, although it does hold an important part in Australia’s numismatic history. The Swan Pattern dollar has been nicknamed the “Goose dollar” by collectors and has risen in popularity in the past few years. When decimal currency was to be introduced in 1966, collectors were surprised to learn that a one dollar coin would not be included in the new issues. So, in 1965 the Australian Coin Review magazine ran a competition and the winning entry submitted to the Australian government. When this coin was rejected by the authorities, competition organizers decided to have it minted privately . In 1967 it was engraved and struck by John Pinches medallists of London. The design, by Andor Meszaros features a swan with Australia 1967 on the obverse and wattle with 100 (cents) printed on the reverse. On the obverse (swan side) at approximately 4 o’clock right next to the rim are the designers initials which may be mistaken as a scuff on the coin surface. There were 1500 specimen uncirculated silver coins issued that featured a milled edge, 750 proof pieces with a plain edge and 10 gold with the plain edge. The silver proof was originally available at $13.50 while the silver uncirculated examples were $10. It is believed 2 of the gold coins were lost in the Ash Wednesday fires in 1983 (John Gartner collection) so it could be said that there are only 8 in existence. John’s house at Mount Macedon in Victoria was destroyed with the coins along with the actual dies used to strike the coins. All coins were originally issued in a maroon coloured case inscribed with “Australian Pattern Crown” inside the lid and in the case for the proofs, the word “proof” was added. Specifications differ between the gold and silver issues. All are 38 milimetres in diameter and the silver releases weigh 28.7 grams and the 22ct gold 40.3 grams. McDonald’s catalogue (2009) value for these coins is currently $925 for the spec.unc (issued at $10), $975 for the silver proof ($13.50 issue price) and $12,000 for the gold proof. Update July 2009 : A gold goose dollar sold on eBay in July 2009 for $12, 500. Another gold goose sold at the Nobles Sales 103 in 2013 for $18,000 plus commission on an estimate of $8,000, a very strong price. Update 10 July 2015 : The latest McDonalds catalogue (2014) values the milled edge, circulation issue at $2250 and the proof at $2450. However, the Goose Dollar market is now largely dominated by third party graded coins (PCGS in particular). Ungraded coins (proof or milled edge) have been selling raw for between $1500-$2000. Graded coins in the MS/PR64-MS/PR66 range fetch similar prices while MS/PR67 or better can expect to fetch quite a bit more. A 1967 Goose dollar is likely to be worth a few hundred dollars more if it comes with an original box, regardless of whether the coin is slabbed or not. As of July 2015 there were 3 MS68’s graded by PCGS (8 MS67’s) and 2 PR68’s (no PR67’s). Update April 2017: A gold swan pattern dollar recently sold at Nobles Sale 114 28-31 March 2017. From the personal collection of E Cummings (Edlins of Canberra) the gold pattern of which there may only be 8 still in existence sold for $24,500 plus 19.25% buyers premium, that’s $29,216.25 wow what a result! ‹ Brisbane Coin Fair Overprints – Collectable or Silverfish Food?